A couple of summers ago I was treated to the pleasing but discerning modern jazz found all over Torben Waldorff's Afterburn. The great Dane guitarist/composer who resides in Sweden is a household name in our little 'berg on the internet, and needs no intros on this site. But his issuance of a brand new record at the beginning of this year gives us reason to revisit Waldorff and pass along the lowdown on his latest project. 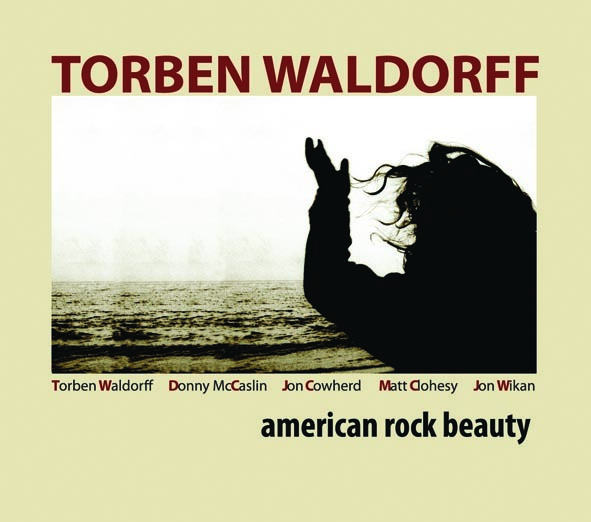 American Rock Beauty is, like Afterburn, an ArtistShare project, one that Waldorff worked on since 2008 and for much of 2009. As it comes in the aftermath of such a highly-acclaimed album, it had much to live up to. But Waldorff has succeeded in creating his own template and all he had to do was to be himself, again. "Being himself" meant surrounding himself with fellow musicians he was most comfortable with, and so he brought back in mostly the same crew he used for Afterburn: his old Berklee classmate Donny McCaslin (tenor sax), Matt Clohesy (bass), and Jon Wikan (drums). Sam Yahel was replaced on keyboards by Jon Cowherd, a member of Brian Blade's Fellowship. As before, the music resides in a sweet spot where jazz overlaps with a generous smattering of other distinctly American strains of music, which in itself isn't a difficult task. It's making it come across naturally and uncontrived that is where the big accomplishment lies. For Waldorff, that's simply a matter of letting the music come to him, not vice versa: "The tunes are all written from an extremely intuitive place," he explains. "I usually conceived them in minutes. It has been as though the songs and the melodies were hanging there right above me all the time --- I just had to get myself to a place where I was ready to just reach out and pull them in." All of the Waldorff trademarks are present on American. As a leader, he seems to sense where it's right to take charge and when it's more appropriate to sit back and let his band become equal partners. As the solo composer, he's going to set the overall tone and dictate the basic character for the songs. However, he writes these songs with these musicians in mind, and together they work out the ultimate personality of each song. Heck, with accomplished musicians as these are, they couldn't help but to do so. The songs contains meter and harmonic shifts, oscillations between major and minor chords, and intricate interplay and yet remains richly lyrical. Waldorff himself describes the songs as being "very vocal in character," a point driven home in his vocal tracing of the basic theme contained in "Song-Ella", an idea that's long served to heighten the strong melodicism on many Pat Metheny Group songs, too. The use dichotomy is employed well in "Lama," a free-flowing melancholy piece that switches midstream into a progression of six chords played staccato while Wikan along rumbles with abandon underneath. Many tunes blur the lines the supposedly separate jazz from other music forms. "Shining Through" only lacks inspirational lyrics and maybe a pedal steel from being called a straight up country-gospel tune, but Cowherd's Sunday piano and Wikan's brush work keep the song chugging along in an irresistible way. "Shark" is more overtly rock-jazz than the other tracks, but McCaslin's cascade of notes and Waldorff's acute improvisation can only come from players well-versed in Parker and Gillespie. The soft, contemplative "American Rock Beauty" melds in folk harmonies to create a song that is ripe with colorful modalities underpinned by Cowherds' Rhodes while supplying Waldorff, Clohesy and McClasin plenty of space to express themselves. Even where some selections stick closer to the jazz aesthetic, such as "Waves," or "Late," there's an overall characteristic present on these cuts that pervades throughout the whole album. It's one that thrives on the melody following a natural course that's pleasing to hear but avoids predictability. Also, there's enough subtleties to keep the songs fresh after many listens (check the bass/guitar/sax interplay in the middle of "Late," for a terrific example). But Waldorff and Company never come on too strong with their artistry. They let the radiant beauty that is found in American Rock Beauty come to the listener in a intuitive, natural way. Much the same way these songs came to Torben Waldorff.